DE5 – UNITED STEEL COMPANIES Ltd., Exton Park & Froddingham Quarries. The huge Exton Park system which extended up to 8 miles from our site relied on Yorkshire Engine Company products. 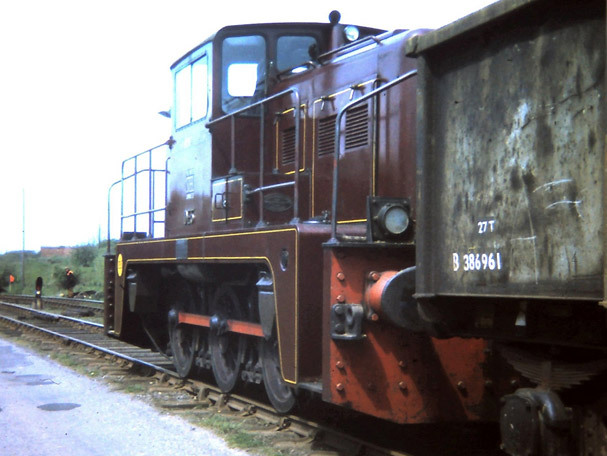 DE5 was one of the 0-6-0 diesel electric locomotives introduced to dieselise the system in the early 1960’s. The design, known as JANUS, incorporates two engines and generators with a central driving cab creating a powerful 440 horse power loco useful in tackling loaded and empty trains on the steep bank out of our site and up to the quarries in Exton Park. This fantastic picture shows DE5 waiting for the colour light signals before descending under the Oakham to Cottesmore road and down the bank toward the Museum site, pulling loaded 27 ton BR Tippler wagons. The loco is in the maroon lined yellow livery carried by all the USC locos, complete in this case with cast metal cabside lettering and the plant number 1395 in a large yellow circle on the running board. DE5 was the last loco to leave Exton Park when it closed in 1973, moving to Normanby Park, Scunthorpe in December 1973. Bought by a group of members and arriving on site 5th December 1982, the loco was recently purchased for the museum by a public appeal well supported by enthusiasts and locals to reflect that the loco has a secure home on the site it once worked at. The loco is not operational at present but plans are afoot to restore the locomotive to display condition as it worked at Exton Park some 40 years ago.